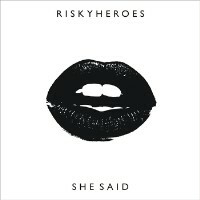 Describing themselves as a band that draws inspiration from “love and fools,” Sheffield’s Risky Heroes have a knack for creating that signature indie pop rock sound. The band has been together since 2008 and after two fruitful years, they managed to release their debut EP, Hearts A Pounding. This landed them a UK single deal and a tour from On Records. She Said is their latest compilations, rolling off the presses and offered for free since May 2012. Rockish and upbeat are two good words that’ll come to mind when you listen to this band. Risky Heroes carry every bit of that British “hipster” sound and they actually sound pretty good. With a nice accent, Aiden (vocalist) mouths off complains and praises about a lady love in It’s Been Awhile as catchy guitars play on at the background. On the other hand, David & Goliath, is a fast, upbeat track that showcases a bit of punk. It’s in and out of there in less than 4 minutes and quite a fun track to listen to. Despite delivering fairly uptempo cuts throughout the EP, they close the album with, Cut My Strings. A track that gives a peek at the band’s quieter side (well, for at least a minute.) After this, they rip into their regular pop rock sound. In the end, if you like British new wave or just good and catchy indie rock, you’ll find this album as perfect. Go ahead and grab the download. The boys are offering this absolutely free.